We often get asked to recommend Taxidermy information to our friends , and as a consequence of this the website seems to have develped a life of its own. This page is dedicated to the life and work of John Gould. If you have any information pertaining to John Gould, please get in contact. 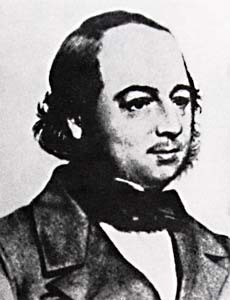 Portrait of John Gould. .
Born in 1804 at Lyme Regis on the English coast, he was one of 5 children and the only son of John and Elizabeth Gould. Gould junior was nearly thirteen years old when his parents moved from Stoke Hill to Windsor where his father had taken the position of head gardener at Windsor Estate. A young Gould was able to expand his interest in ornithology at Windsor, where he would spend much of his free time when not assisting his father, exploring the estate and surrounding country side in search of nests, eggs and bird specimens. By the time he was 21, John Gould had departed the horticultural field to pursue his growing passion of ornithology and taxidermy, a move that was to mark a turning point in his career, and one in which he was to never look back upon. He moved south to London, where in 1825 he set up his own business practice in taxidermy at 11 Broad Street Golden Square Soho. Gould married Elizabeth Coxen in 1827. Elizabeth traveled and worked with Gould until her death in 1841. Shortly after their marriage, Gould, who was a skilled taxidermist, acquired a collection of bird skins from the hill country of the Himalayas, many of them new to Europe. After he stuffed and mounted them, he realized their artistic possibilities, and his new life as a bird illustrator began. Elizabeth helped to draw, lithograph, and color many of his first plates. Over the next 57 years Gould published more than forty large folio volumes. 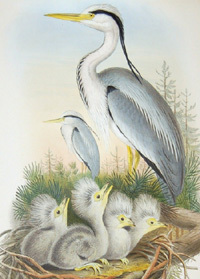 He devoted his life to the study of birds and to the production of the "Gould Folios," which began publication in 1832. There were 41 volumes in all, containing a total of 2999 different prints, being the first near-complete ornithologies of Asia, Australia, Britain and New Guinea. The first set appeared in 1831 and the last in 1888, seven years after Gould's death. In 1828 Gould accepted the position of Curator and Preserver to the Museum of the Zoological Society of London, at a salary of �0 per annum. At the same time he continued his private taxidermy business, acted as advisor to national institutions and travelled widely in England and on the Continent, buying and selling specimens. 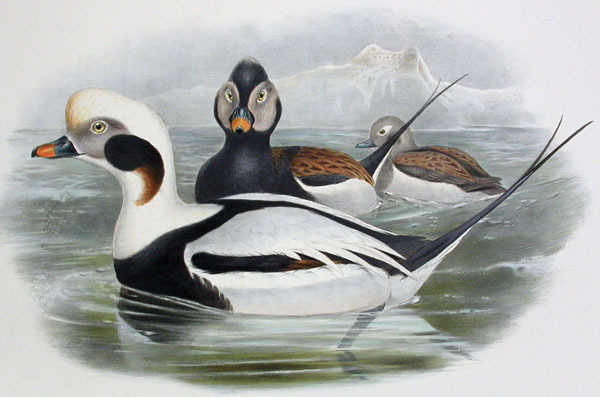 A notable absence from the London taxidermists present at the Great Exhibition was none other than John Gould, although he was represented through an exhibition of a new coloring technique of his plate books he had just patented. 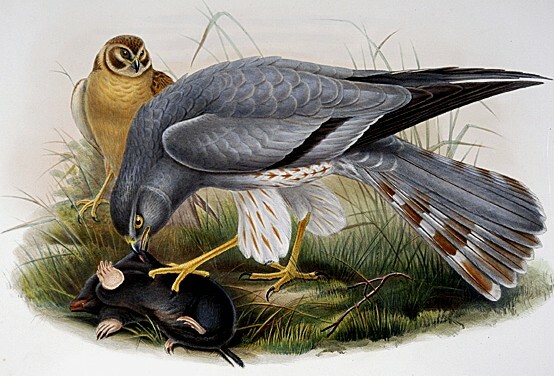 Original by John Gould 1851, of a pair of Hen Harriers, the male of which is inspecting a mole. . However, Gould had the commercial mind to prepare an exhibition of stuffed Hummingbirds and display them 3 miles away from Hyde Park in the Zoological Gardens of Regent Park. With the approval granted by the Zoological Society of London, Gould financed and constructed a wooden building some 60 feet long near the Zoological Lion house for the purpose of the exhibition. This was a shrewd move by Gould the businessman for had he exhibited the hummingbirds in the Crystal Palace where charging was forbidden, he would have earned nothing. At the Zoological Gardens he took full advantage of the huge crowds flocking to London to visit the Great Exhibition, charged his visitors six pence at a time and managed to make a good profit which was said to be eight hundred pounds. 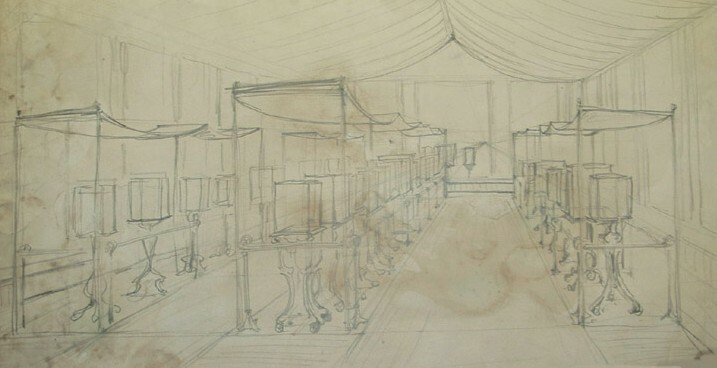 The exhibition consisted of twenty-four elaborate display cases each approximately 2 feet 2 inches high and 1 foot 10 inches wide, arranged in rows and surmounted by canopies suspended from the ceiling to diffuse the light. The design of each case differed according to whether they had four, six, or eight panels of glass in their structure, and each rested on a wooden base, painted black and gold, which were all raised on a pedestal support. Orginal drawing by John Gould 1851, denoting how he wanted the Humming bird cases to be exhibited. . 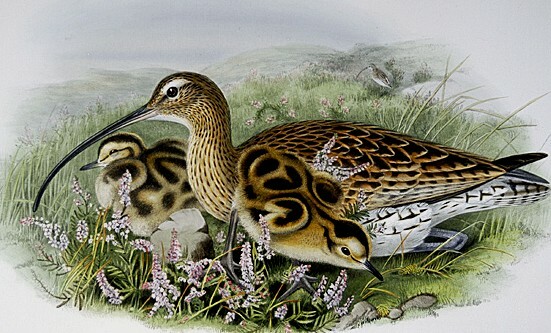 Original by John Gould 1851, Curlew with young in moorland scene. . 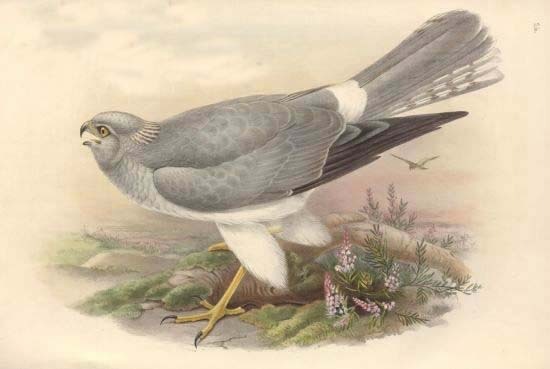 Original by John Gould 1851, Honey Buzzard. . Original by John Gould 1851, Black Headed Gulls with young. . Original by John Gould 1851, Great Northern Diver. . 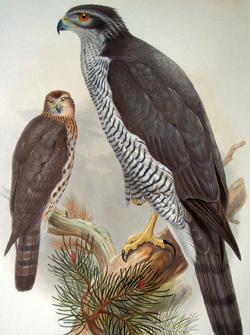 Original by John Gould 1851, Peregrine Falcon. . Original by John Gould 1851, Cornish Chough. . Original by John Gould 1851, Male hen Harrier in moorland scene. .
Each case contained between five and fifteen Hummingbirds, all strategically positioned to exhibit their chief characteristics and to emphasis the metallic iridescence of the male plume. 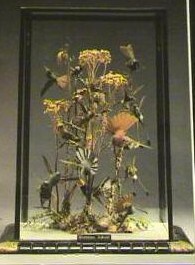 Gould introduced the unusual innovation for the period of foliage and nests into the cases to give an impression of natural habitat, an unusual innovation for that period. John Gould 1851, denoting the Humming bird cases exhibited in the Zoological Gardens of Regent Park. This is from the Illustrated London News at the time. Seventy-five thousand people visited Goulds display of Hummingbirds in 1851, compared with over six million people who visited the Crystal Palace between 1 May and 15 October 1851.
. It is also interesting to note that the last single case, from the above exhibit, that is not in a museum recently sold on Ebay (January 2005)for �000. This case has not stayed in the UK. It appears to have been purchased by an American collector come dealer. This is another piece of Victorian Taxidermy of significance that shall not return to the UK. It's importance is clearly not recognised. He died in 1881, leaving a priceless legacy of beauty and scientific knowledge. He chose his own epitaph: John Gould the Bird Man. 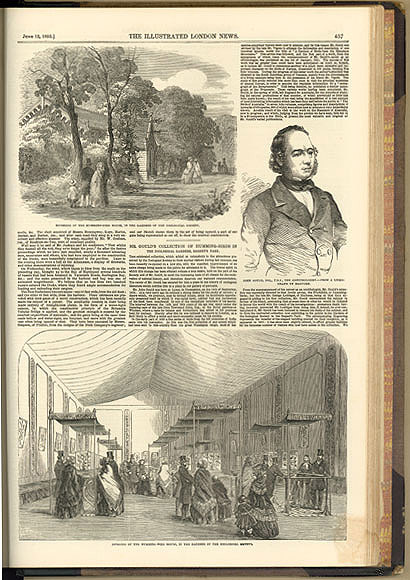 Gould had always been his own publisher, financing his ventures largely from the advance subscriptions for his works. At the time of his death, his stock of unsold copies, unbound text and plates in various states, lithographic stones, drawings and paintings, amounted to nearly three tons. The entire lot, along with Gould's copyright, was purchased by the London bookseller, Henry Sotheran Ltd, and put in storage where it rested undisturbed for over 50 years. In 1936, Ralph Ellis went to London and when he left in December 1937 a great part of the John Gould archives went to America with him. 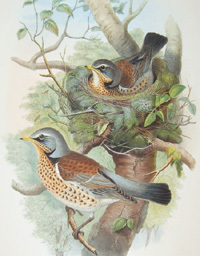 Original by John Gould 1851, FieldFares . . Original by John Gould 1851, Gosshawks . . Original by John Gould 1851, European Grey Heron. . 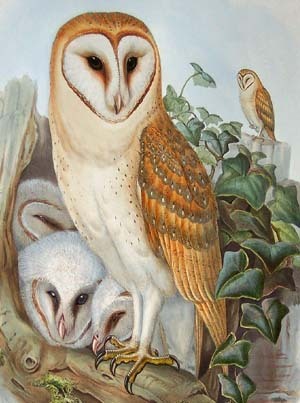 Original by John Gould 1851, Barn Owls with chicks . . 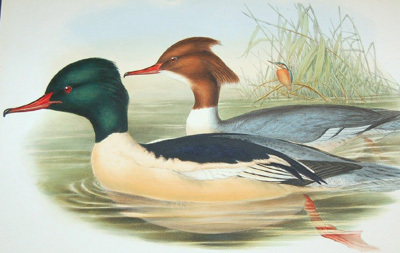 Original by John Gould 1851, European Goosanders . . 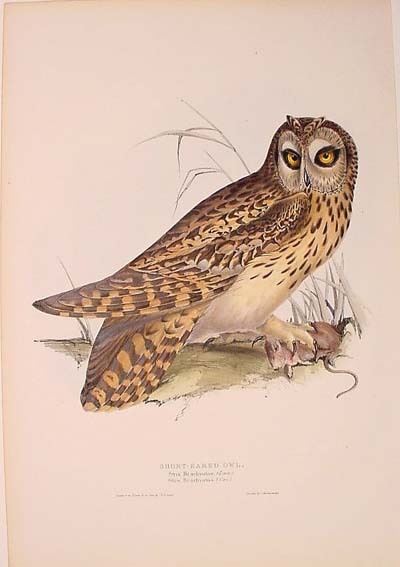 Original by John Gould 1851, Short Eared Owl with prey. . 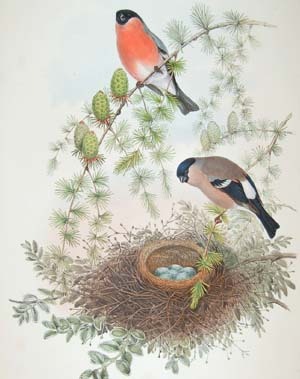 Original by John Gould 1851, Bullfinches with nest. . 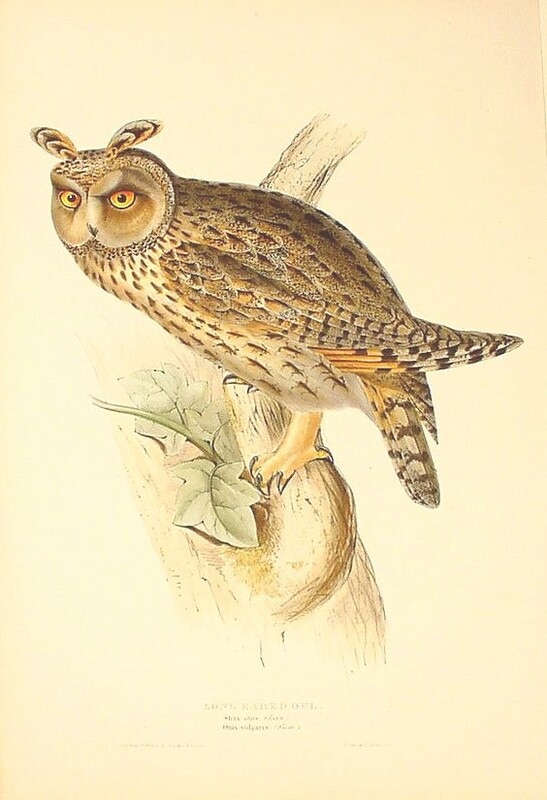 Original by John Gould 1851, Long Eared Owl. . 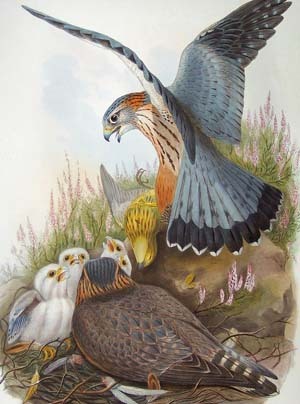 Original by John Gould 1851, Merlins with chicks . . 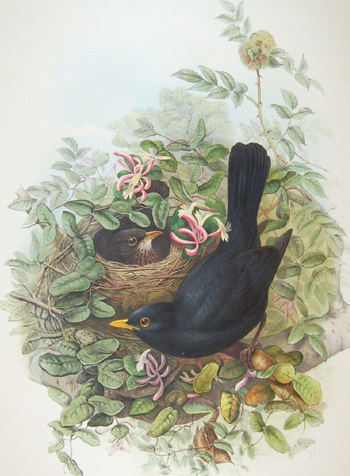 Original by John Gould 1851, Blacksbirds . . 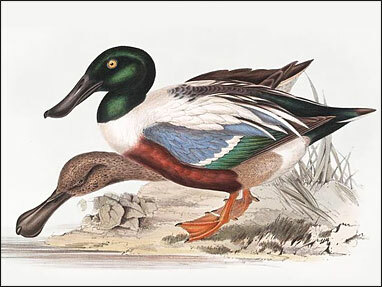 Original by John Gould 1851, Shovelor Ducks . . 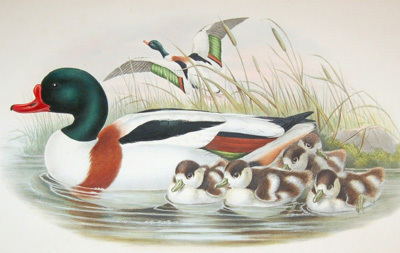 Original by John Gould 1851, Shellducks with chicks . . 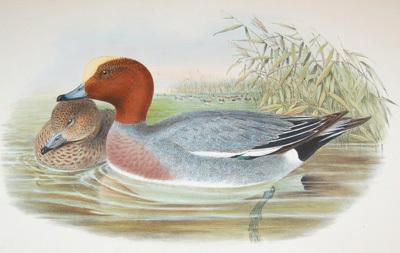 Original by John Gould 1851, European Wigeon . . Original by John Gould 1851, Capercaillie . . Original by John Gould 1851, Coot. . 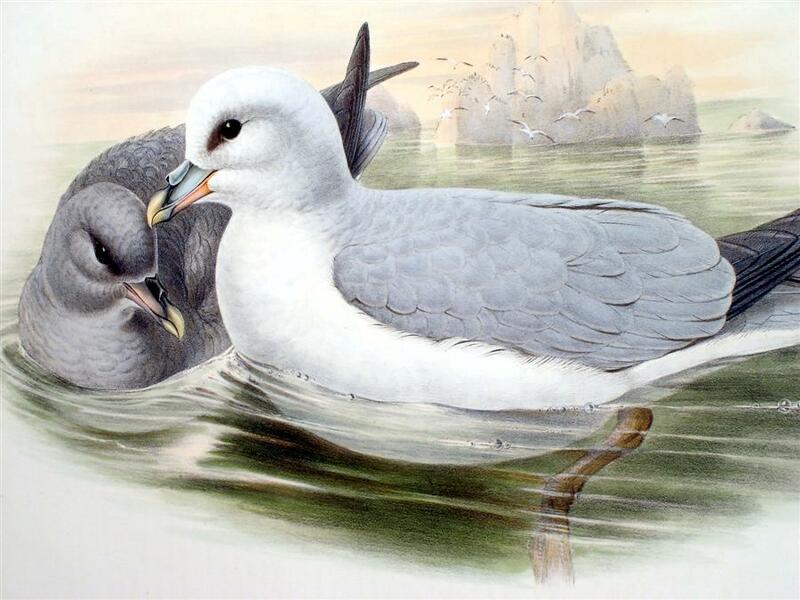 Original by John Gould 1851, Fulmar's. . 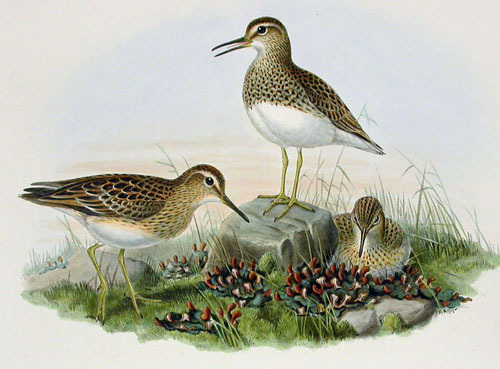 Original by John Gould 1851, Sandpipers. . 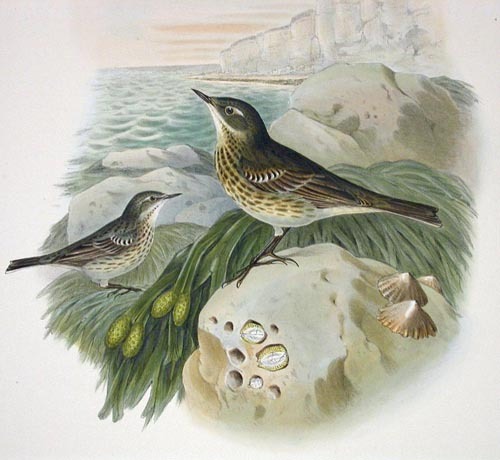 Original by John Gould 1851, Rock Pippits . . 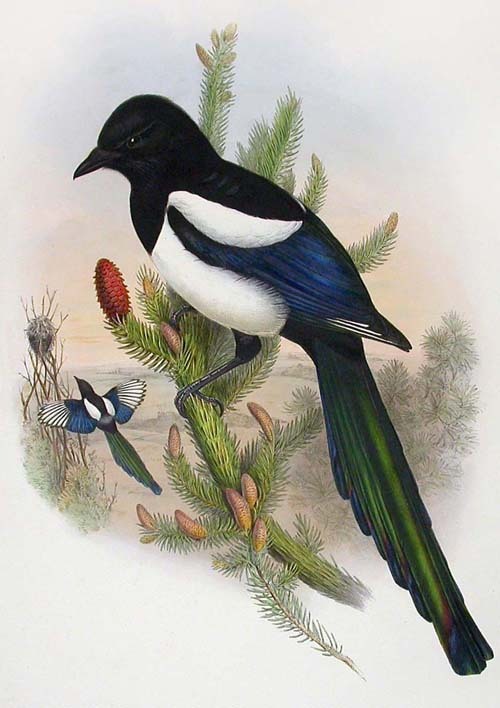 Original by John Gould 1851, European Magpie . . 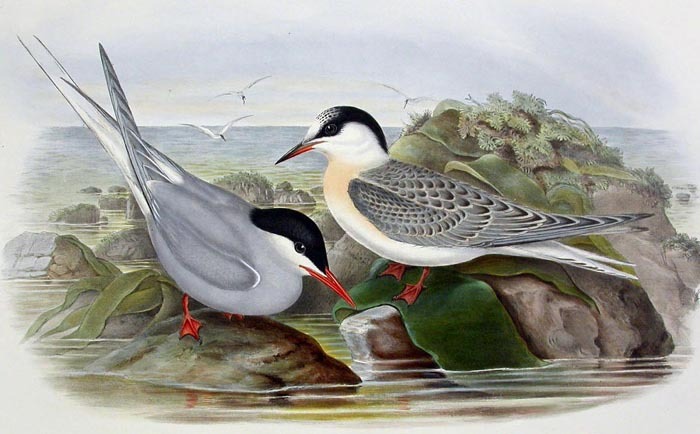 Original by John Gould 1851, European Arctic Tern. . 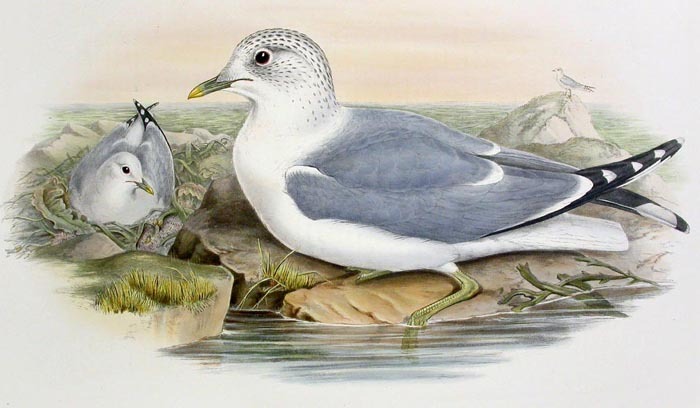 Original by John Gould 1851, European Common Gull. . 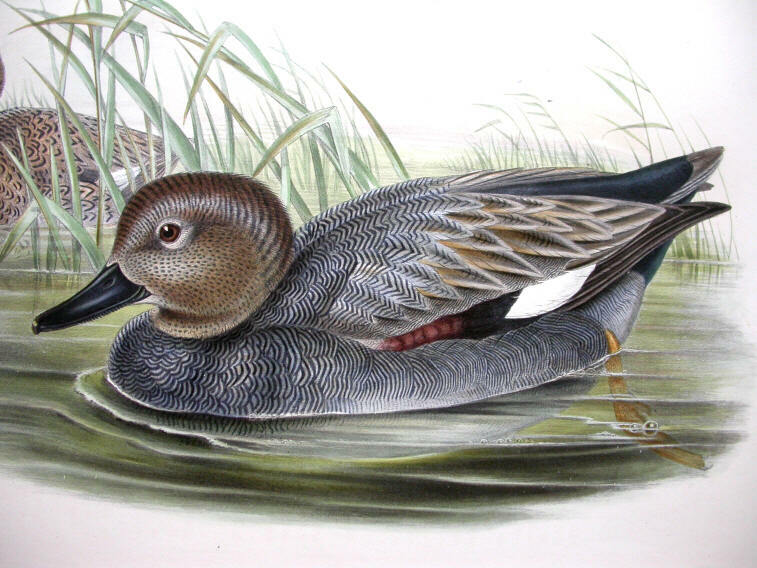 Original by John Gould 1851, European Long Tail Duck. . 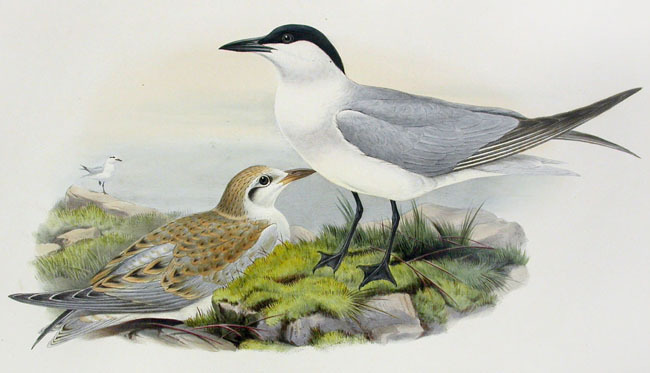 Original by John Gould 1851, European Sandwich Tern. . Original by John Gould 1851, European Dippers and chicks. . Original by John Gould 1851, European Pallas Sandgrouse. . 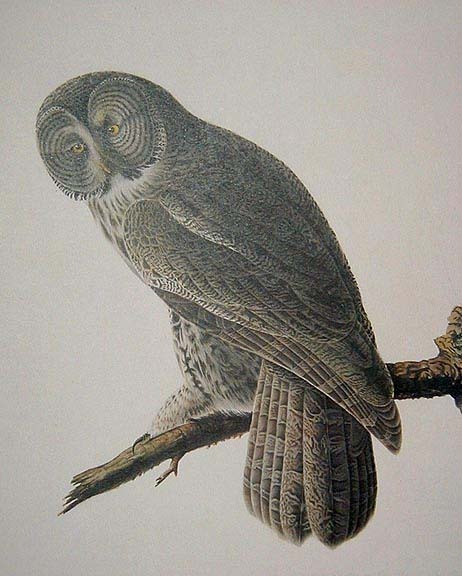 Original by John Gould 1851, Ural Owl . . Original by John Gould 1851, European Storm Petrels. . Original by John Gould 1851, European Gargraney. . 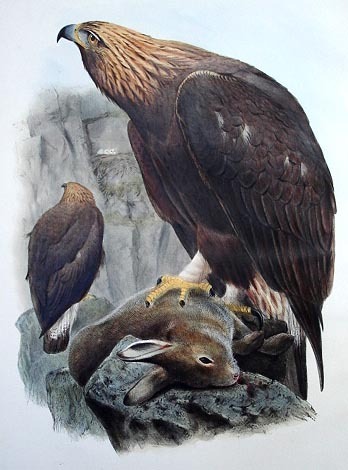 Original by John Gould 1851, Golden Eagle . . 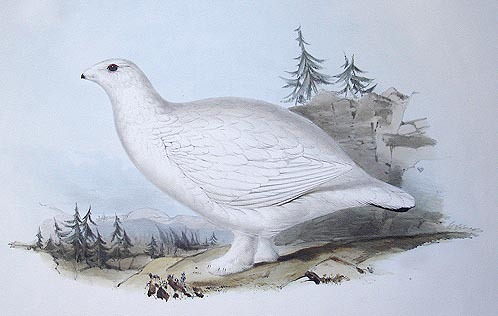 Original by John Gould 1851, European Ptarmigan in Winter Plumage. .
1831. A Century of Birds from the Himalaya Mountains. The Ellis Collection has a copy of the plates in original wrappers dated 1831, a bound copy dated 1831, a bound copy dated 1832, and unbound sheets of text dated 1832. 1832-37. The Birds of Europe. 5 volumes, originally issued in 22 parts from 1832 to 1837. The Ellis Collection has a bound copy dated 1837 and a second bound copy composed of uncolored pulls of the plates on India paper which is reputed to be Gould's own "reserved copy." 1837-38. A Synopsis of the Birds of Australia, and the Adjacent Islands. The Ellis Collection has a copy in the original four parts, dated January 1837, April 1837, April 1838 and April 1838, as well as a bound copy. 1837-38. The Birds of Australia, and the Adjacent Islands. The only two parts published of a work canceled when Gould decided to go to Australia. The Ellis copy is in original printed boards with Part I dated August 1837 and Part II February 1838. 1837-38. Icones Avium, or Figures and Descriptions of New and Interesting Species of Birds from Various Parts of the Globe. The Ellis Collection has the two parts in original printed boards dated August 1837 and August 1838. 1840-48. The Birds of Australia. In Seven Volumes. Originally published in 36 parts from December 1st, 1840 to December 1st, 1848. The Ellis copy is bound and dated 1848. 1841-47. J. Gould's Monographie der Ramphastiden, N黵nberg. Gould's own copy of the original four parts of his A Monograph of the Ramphastidae, translated by J.H.C. Sturm. 1841. The Zoology of the Voyage of H.M.S. Beagle . . . Part III. Birds, by John Gould, London: Smith, Elder and Co.
1841-42. A Monograph of the Macropodidae, or Family of Kangaroos. The two parts in original printed boards (Part I dated August 1st, 1841, and Part II May lst, 1842) and a bound copy. 1843-44. The Zoology of the Voyage of H.M.S. Sulphur, London: Smith, Elder and Co. Parts 3 (October 1843) and 4 (January 1844), Birds, by John Gould. In original parts. The Ellis Collection has the same plates also in a volume labeled"Atlas of Plates of Sulphur." 1844-50. A Monograph of the Odontophorinae, or Partridges of America. Originally published in 3 parts: 1844, 1846, 1850. The Ellis copy is bound and dated 1850. 1845-60. The Mammals of Australia. The twelve parts in original printed boards, dated from May 1st, 1845 to November 1st, 1860, and a bound copy in three volumes dated 1863. 1848. An Introduction to the Birds of Australia. The introductory matter to The Birds of Australia, set up in small type and published in octavo in a limited number, probably issued on August 1st, 1848. 1849-61. A Monograph of the Trochilidae, or Family of Hummingbirds Originally issued in 25 parts, dated February 1849-September 1861. The Ellis copy is the final five-volume form, dated 1861. 1850-83. The Birds of Asia. Originally published in 35 parts, January 1st, 1850-August 1883. The Ellis copy is the final seven-volume form, dated 1850-1883. 1880-1887. A Monograph of the Trochilidae, or Family of Hummingbirds Supplement. Published in five parts, the first two (1880 and 1881) by Gould and the remaining three (1883, 1885, 1887) by R. Bowdler Sharpe. The Ellis copy is the final form published as a single volume by Henry Sotheran & Co., dated 1887. 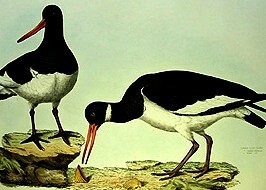 Orginal drawing by John Gould 1851, Oystercatchers. .